This is really good! I say this as someone who fell under the spell of Heidegger in college, and spent a lot of time later gaining some critical distance from his thought. I used to get the shivers reading the “Letter on Humanism” – something I am now mildly ashamed of – and thought that there was something truly profound in Heidegger’s painstaking “translation” of a one line fragment of Anaximander. But Heidegger really can marshal a kind of rhetoric of revelation in remarkably effective way, and some of his thought does produce a kind of poetry, as you note. What do you make of the fact that at the very end of his life Heidegger did find common ground with other traditions of thought – e.g., Japanese and “Eastern” traditions more generally, if perhaps in a superficial way? (I”m thinking of “On Time and Being”)? “Rhetoric of revelation” is a good way to put it–secular modernity (or whatever you want to call it) poses a worldview considerably harder to challenge philosophically than most of its predecessors and competitors. Integrating systematic doubt into a worldview really strengthens it. 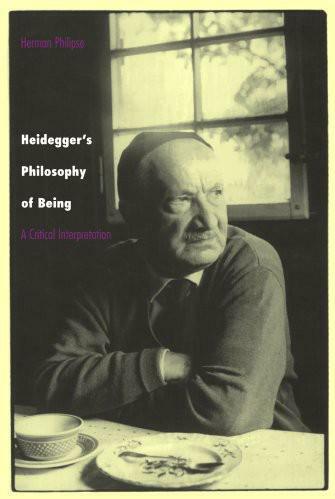 Since it, like all worldviews, is still insufficient, I do find it worthwhile to look at folks like Heidegger who put up vociferous challenges. But in light of things like Philipse’s study, I think Heidegger is more revelatory of the neuroses of first-world intellectuals than of any real alternative. I am not well-versed on Heidegger’s interaction with Zen and eastern philosophy, but there is apparently evidence that he was aware of it as early as 1922, before Being and Time. Reinhard May’s Heidegger’s Hidden Sources is the go-to book on this. What IS worth noting is the roughly concurrent Kyoto school of semi-mystical Japanese philosophers–Nishida, Tanabe, Nishitani–which had similar nationalist and religious leanings to Heidegger. Tanabe studied under Husserl and Heidegger in 1922-1924, no less. So there was clearly some interchange going on. And the overlap of political ideology and philosophical interest deserves serious attention. A major comparative study is clearly needed. My own interest in eastern philosophy is oriented toward Madhyamaka & its related schools rather than Zen or Daoism. This thread has been more attended to by “analytic” types like Siderits, Priest, Albahari and Westerhoff. So the Zen-Heidegger connection is not one I can speak to with expertise. Thanks for writing this great essay, David. I found Heidegger incoherent and wrote him off as such; but even so, I had always been left with that nagging feeling that maybe my incomprehension was the real problem. This essay illuminated a lot of great points. The summary of the rhetorical strategems alone is worth 10 essays by lesser mortals.